As a norfolk va photographer, Luke and I are always on the hunt for new locations. Secluded with fun pretty scenery. If you have any favorite places please let us know we would be so grateful! Then there are those spots that are our favorites. Locations that we can trust and shoot at anytime of the day. East Beach in Norfolk is one of those locations. 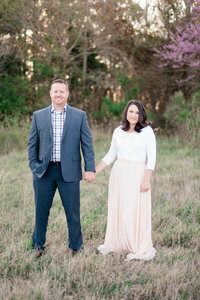 We have shot bridal sessions, engagements, and even a wedding here and I don’t think I could ever get enough! If I could afford one of those homes on the beach I would definitely move there in a heartbeat! The view of the ocean is beyond words. And the sunsets there are so beautiful and calming. When Brendan and Samantha decided on East Beach I was pretty happy. It’s been almost a year since we shot there and I have been itching to go back. We decided to start at 7:30 in the morning due to the heat. Saturday was extremely hot and I am glad we got an early start with their session. By the time we finished up we were all sweating! Brendan knew of Samantha through his sister. He began following her on Instagram and was smitten by her beauty. When he finally got the nerve to ask her out he invited her to Bush Gardens. I loved how Samantha described him as so nervous that she barely got a few words out of him that whole day. There must have been something there though because when Brendan invited her to a movie later that evening she accepted and had a great time. After that it their friendship and love progressed. These two got engaged earlier this year. After realizing how fast venues book up, they decided on a Friday wedding at The Historic Post Office in Hampton. They will tie the knot Friday October 13th of this year. Some might say Friday the 13th…Isn’t that bad luck? But the number 13 for their family has significant meaning and they are excited to carry on the tradition. From her casual outfit to cute dress, this girl has style! And I loved the dress that we saved toward the end. I was a little worried that the light wouldn’t work, but those are my favorite pictures! I love the colors in the images and I loved the way it challenged us to shoot in direct sun. It can definitely be scary to shoot in direct sun but sometimes you don’t have an option. My number one tip on this, is underexpose at least one stop on the image. Also, as long as you don’t have the couple looking at you and squinting you get really natural images and beautiful even light. Again, these are some of my favorites! Luke and I are excited to see these two later this October. I have a feeling these two know how to throw a party and we cannot wait to celebrate with them!